MeshWorks has advanced cutting, blending & stitching functions to create early stage concept FE & CFD models very rapidly. Technology Features: Local regions from the donor FE or CFD model can be cut, morphed and stitched to the target FE/CFD model resulting in a new concept quickly. Advantages: Early Concept designs can be created in the FE level there by eliminating CAD in the loop. The same shape change could be replicated on the same Model of Different Domain. Benefits: Concept FE Model can be created in one week where as the conventional method would take around 12weeks. Technology Features: Under Body Platform of one Model and the Upper Body of another model can be merged resulting in a new concept design quickly. 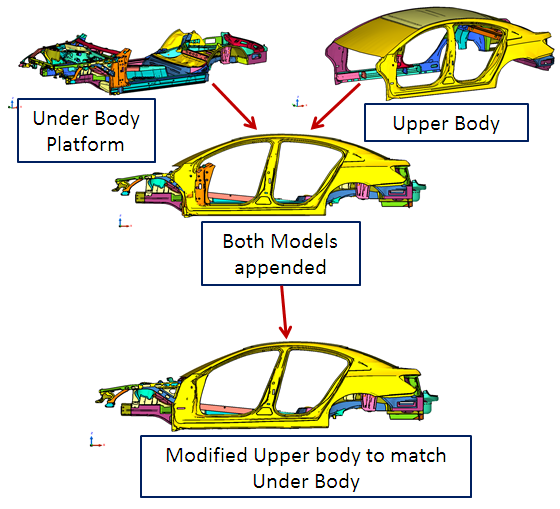 Advantages: Early Concept designs can be created in the FE level by merging the Underbody of the Model that is performing well in Crash with Upper body of another Model that is performing well in NVH. This could be replicated on the same Model of Different Domain.